Bold conception is a requirement at the cutting edge of live music entertainment and the production team behind the new U2 360° show has dramatically raised the bar for international tours in terms of engineering, technology and design. At the heart of U2's stunning show, first viewed by 90,000 excited fans at Barcelona's Camp Nou stadium on June 30 and at the Stade de France on July 11 and 12, is the giant in-the-round stage, built by Belgian staging specialists Stageco, supporting 170 tons of giant screens, audio and lighting. The stage's four legs arch out gracefully to embrace the audience, giving fans unprecedented and extensive access to the superstars on the pitch, while its gargantuan proportions echo those of the legendary stadium, carrying the band's performance to every seat in the house. This is one of the largest stages ever toured in any field of entertainment. The structure's central grid is raised 28 metres high, with legs traversing the width of the famous soccer pitch and a central antenna reaching as high as 51 metres. The Stageco steel structure weighs 220 tons, excluding both the 90 tons of steel ballast that travels with each system and the rigging loads. Stageco has produced three identical systems for the band's world tour, each one taking a specialist Stageco team five days to erect (four days of Stageco building plus one day of production) and another two days to dismantle, before being packed onto 38 trucks for transportation to the next venue. The story of how the stage made its journey from concept to completion is equally remarkable; it required the vision of the artists themselves, the inspiration of renowned stage and set designer Mark Fisher and his team at Stufish; the logistical and touring expertise of the show's internationally respected production manager Jake Berry, and innovation by Stageco, who adapted heavy civil engineering techniques to the entertainment world in a way that has never been achieved before. The design all started life as a simple crayon and paper sketch by Mark Fisher inspired by the iconic design of the famous Theme Building restaurant at Los Angeles International Airport (LAX). The concept evolved through discussions between Fisher and Stageco, reflecting the aspirations of U2, who wanted the show to be as inclusive as possible for fans. In October 2008 U2 "pressed go" on the 360º tour project and Stageco was asked to start work on detailed structural calculations, including a practical modular design which would allow the system to be toured. "As it became clear what the designer and the band wanted to achieve it was obvious to me that this was something unprecedented," says Hedwig de Meyer, President of Stageco. "The sheer scale of the structure, the span of the legs, lifting the huge technical production 28 metres in the air, none of this has ever been done in our industry. The need to build and dismantle it in line with touring schedules added an extra dimension to the challenge. 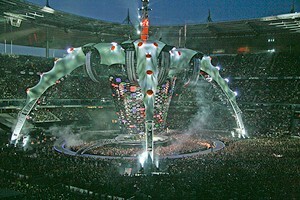 This was more like a civil engineering project than a rock and roll tour and it required a completely new technology. Not only did we need to consider the weight loading and engineering stresses but we had to work out the sheer logistics of building the structure on site and touring it." Stageco appointed a skilled in-house team with the experience and expertise required to deliver the project, who worked with outside agencies where necessary. The in-house CAD team made the detailed technical drawings, with Stageco's Bert Kustermans responsible for getting the stage from the drawing board through the manufacture process of all components. "We have had to consider the stresses placed on every component," he said. "Every piece of this stage was designed and manufactured from scratch." Jeremy Lloyd was the project manager from the Stufish office. He worked to ensure the practical reality of the manufactured stage achieved the design aspirations of the artists while still being functional from a touring technical production perspective. "If anyone could do this it was Hedwig and his team at Stageco," he said. "Mark (Fisher) and I were in constant discussion with him over the months during which the project was conceived, so everyone was fully aware of the challenges that lay ahead. Part of U2's decision to proceed with the project depended on the successful delivery of the project so when Hedwig told us it was possible, we were able to move forward with absolute confidence." Dirk de Decker is Stageco's project manager responsible for both the co-ordination of the developments and the logistics of touring the three systems to achieve the 24 dates in 15 cities that comprise the European leg of the tour. Each system has an experienced project chief on the road with it: Patrick Martens, Hendrik Verdeyen and Johan Van Espen (aka Bellekes). As Dirk explained, "The primary challenge was how to build the stage in stadia under strict deadlines. This process was perfected during lengthy test builds at the company's Werchter facility, which also included exhaustive load testing. There has been a great deal of planning followed by a fair bit of trial and error, but we always find the way forwards - it's what we do." Stageco devised a way of constructing the structure on site which allowed the production to access many more stadia than would have been possible through traditional methods. In the initial phase of the build, the central 80 ton octagon structure which carries the lighting, sound and screens needed to be lifted using three 60 ton cranes. It was suspended on standard Stageco truss while the four main lifting portals - twin towers positioned either side of each leg - were installed. The use of these portals (made up of the company's existing tower system and often used as stages in their own right) allowed Stageco to bypass two particular issues associated with a more traditional technique. The giant cranes they would otherwise have had to use could not have fitted into most stadia. More seriously, they would not have been able to lift the stage with the precision required as any unexpected shift in the balance of this huge weight would have potentially drastic consequences. The "twin tower" portal system allowed Stageco to gradually raise the Octagon to full height, connecting additional segments of the leg as it lifted. One vital extra element was required to make the system feasible. To ensure the portals lifted the structure with the exact precision necessary, Stageco engaged a new partner, Madrid-based hydraulics specialists Enerpac, to develop specialist software-driven hydraulics which would allow the lift to be correctly synchronised. Once the structure was fully in place and secured, the "twin towers" were dismantled and removed leaving in place the 100 percent bespoke structure which is all the public ever see. At the end of every show on the U2 tour, Stageco's logistical ingenuity will come back into play for the de-rig, when the towers are re-installed, the legs dismantled and the "octagon" lowered slowly back to the ground in a perfectly synchronised manner. "I was enormously proud when I first saw the structure erected ready for the first show in Barcelona," says Hedwig. "As we expected, it looked unbelievable. We have created a truly unique stage, which is bristling with innovation. It is a testament to the skill and dedication of everyone at Stageco, Stufish, Jake Berry's production team, Enerpac and component manufacturers that this project has been successfully achieved. It is something that's unlikely to be recreated again for many years and it has moved the expertise in the entertainment production industry to another level." Jake Berry commented: "I've been in the industry for over 35 years yet even I am amazed by the scale and imagination of what has been achieved here by U2, Mark Fisher, the design team and Stageco. From a personal point of view, it's the fact that we're doing something that has never been done before that drives me and inspires the production team. There are so many ‘firsts' on this tour; it's the first time we've built a stage with the legs so far apart which is why we went to Stageco to get something magnificent. "Even with all of the preparations there was still a huge ‘wow factor' when the production team saw what we'd achieved at the first show in Barcelona. We have ‘tweaked' the sound, light and video systems to get as close as possible to Mark Fisher's original concept, which meant the production designs and schedules evolved over the first few shows. We've now banned Mark from making any more changes! "We wouldn't have been able to play half the venues we're playing on this tour if Stageco hadn't really done their homework and come up with an ingenious system of portal towers for constructing the stage, which means we can play 360° even in smaller stadia with more limited access. I can't think of any other company that would even attempt to create a structure like this The band were very keen on keeping the ticket price down and the fact that the 360º production design and this ground-breaking stage opens up more seats and allows us to do that."